We specialized flooring removal using the Terminator which reduces time of floor covering removal and floor prep by at least 50%. - Ceramic Tile Removal, Terrazzo, Granite , Marble, 200 s/f hour. - Carpet Removal, Double Glue, Padding, 2500 s/f hour. 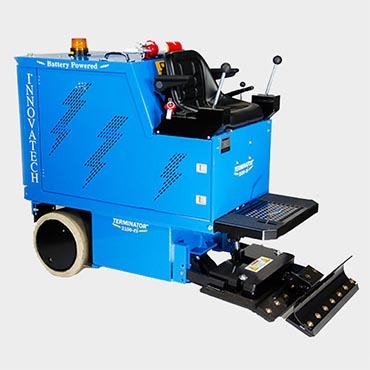 The PRO FLOORING Terminator Machine offers the most capability in a battery powered machine that’s designed for maneuverability. Our machine has the added benefit of zero emissions and quiet operation. The service for removal jobs in enclosed areas; is so clean, quiet and effective that it has been used to remove worn rubber floor tiles in a hospital operating room while a patient underwent surgery in the very next operating bay. MEDICAL, RESTAURANTS, MALLS, SUPER STORES, RETAIL, HOSPITALITY, EDUCATIONAL, OFFICES BUILDINGS, THEATRES AND MUCH MORE. Pro Flooring Solutions provides a full range of flooring solutions from floor removal to new flooring sales and installation. Darle Farms, Apple & Eve, Saint Francis Imaging Center East Hills, NY, Agua Enerviva, E Gluck Corporation, Little Neck. , LIJ Headquarters, Banks, Hotels, Theatres, and many more.